Was your pet diagnosed with a life-threatening blood disorder? Are you feeling overwhelmed with all the ‘doctor-ease’? This book covers it all in language you can understand! You’ve just heard the dreaded diagnosis: your pet has a rare autoimmune disease in which their body is attacking their red blood cells, platelets, white blood cells, or a combination of these. You have to learn quickly and become an expert about something you had no idea even existed. Your pet’s life depends on understanding everything your veterinarian is telling you, and maybe even things only a specialty veterinarian knows. 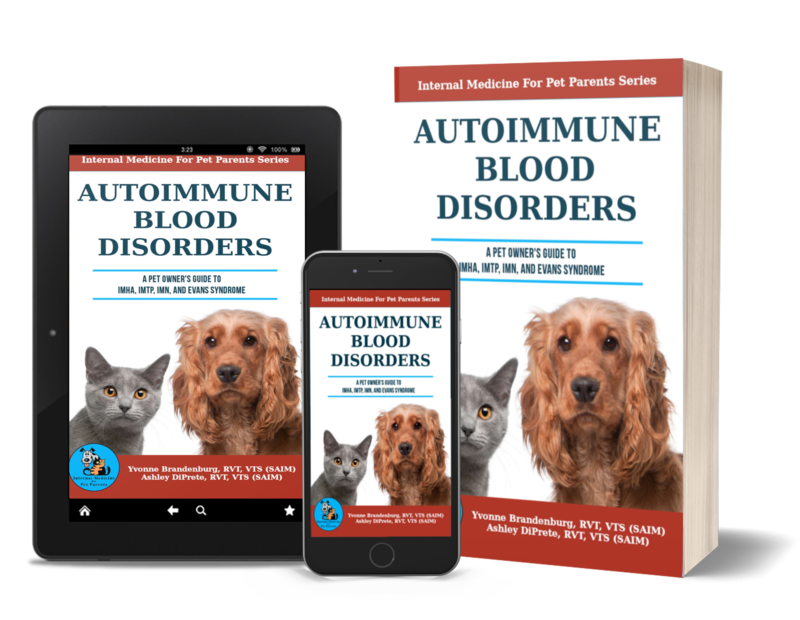 Written by certified internal medicine specialty technicians for pet owners, this book translates the ‘doctor-ease’ into something we can all understand, allowing us to take better care of our pets and fight against these life-changing diseases. Autoimmune Blood Disorders breaks down these four diseases: Immune Mediated Hemolytic Anemia, Immune Mediated Thrombocytopenia, Immune Mediated Neutropenia, and Evans Syndrome. And most importantly, how to live a happier, healthier life keeping these diseases at bay. The first in the Internal Medicine For Pet Parents Series is scheduled for publication in early 2019. Signup to know when the book launches and to sign up for the weekly newsletter.